The Le Labo store in Tokyo lies nestled in the quaint neighborhood of Daikanyama near Shibuya. The area had an understated elegance accented with greenery, small shops and quiet sophistication. We were right on top of the store before I quite registered that it was what we were searching out. The glass paneled walls let in the most glorious natural light. Multi media textures, shapes and materials felt soothing and appealing to the senses. Ashley and I were the only customers in the store and were immediately greeted. Gaiac 10, the Tokyo exclusive, was what I wanted to sniff first and indicated so. He lead me to a stand alone table and sprayed some on two strips for us. Love at first sniff. I pointed to the 50 ml and said I would like it. He sat us at the counter and served us chilled green tea. I set to work naming my new perfume and filling out paperwork while he took care of the customs end with my passport. It was duty-free and no tax, which was nice since it was not a frivolous purchase at 31,000 Yen. After completing the paperwork, Ashley and I made our way around the table sniffing all the others in Le Labo's classic collection. I quite enjoyed the Rose and Patchouli. While we inhaled all the fragrances, they bottled my perfume, labeled it, and sealed it for customs. I am kind of glad I skipped over the candles or I would have been out even more Yen. I can't resist a great candle. Gaiac 10 reminds me of a lighter, more transparent Sonoma Scent Studio Fireside Intense. Smoldering resins of dark woods lighten under a dawn sky. Crystal dew drops flush away the acrid smoke and leave green new growth. The scent dries down into a sweet vanilla musk that is anything but mundane. All the city exclusives are open for purchase on Le Labo's website for the next few weeks only. I bought samples of Chicago, Dubai, and Moscow. 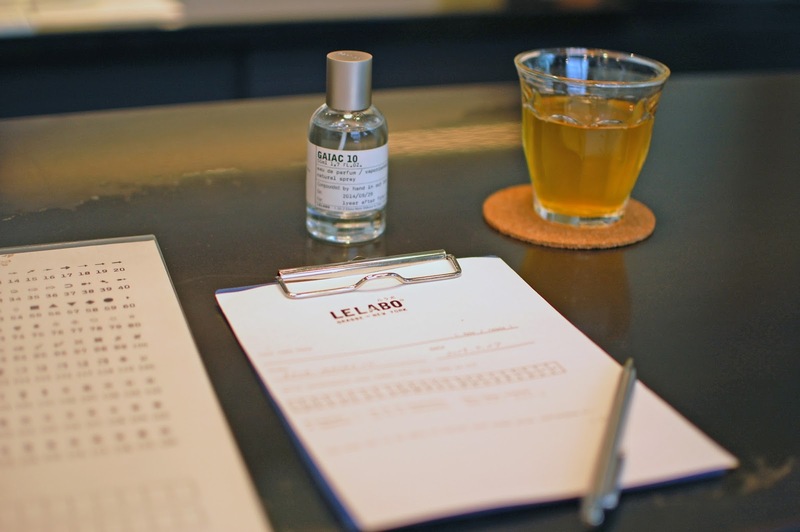 Have you tried Le Labo? Do you have a favorite? How do you feel about city exclusives? I'm glad I was distracted from finding the candles... I am saving my yennies like a mad woman so I can go back for my own bottle!! it's ridiculously amazing! This is one of the coolest stores I've ever been in... so glad we went! I am so glad we went too! It was such a cool experience. I hope you get your Gaiac before you leave Tokyo. It is our kinda scent! Now we need to travel to collect the rest lol! I'll start praying really hard that our next home is in England!! or even Europe (train trip!! ).